A national organization created by family members whose loved ones were killed in the shooting at Sandy Hook Elementary School in Newtown has released a powerful new video on the warning signs of gun violence. An organization created by family members whose loved ones were killed in the shooting at Sandy Hook Elementary School has released a powerful new public service announcement designed to help identify warning signs of individuals planning mass shootings. Sandy Hook Promise unveiled the nearly two-minute PSA, "Point of View," Monday morning, four days ahead of the sixth anniversary of the massacre at the Newtown elementary school that left 20 children and six staffers dead. The video, directed by "Snow White and the Huntsman" director Rupert Sanders, according to Variety, follows a high-school student in the lead-up to a class election. The point of view is from the prospective of the shooter, who is ignored and bullied. In the video, the student overhears his peers voice harsh words about their fellow classmates. A campaign poster with the words "Dead Man" scribbled over a fellow student's face is seen being ripped down from a hallway wall. A school staffer then helps the student open his locker, which is covered in violent imagery, including a picture of an automatic assault rifle. In another scene, a girl walks by a student sitting in front of a library computer where a social media post warning "Tomorrow you'll all be sorry" is visible on the screen. The student appears to sit alone during lunch and is persecuted by other students. In the end, he bursts into the school auditorium with an automatic weapon and yells, "Look at me!" A message at the end of the video reads: "Most people only notice a shooter once it's too late. See the signs and stop a shooting before it happens." “Sometimes you need to see things from a different point of view to understand the problem,” Sandy Hook Promise tweeted in a post sharing the video. "It's difficult because it's from the shooter's point of view. It's all the warning signs and all the things that were happening to him.There's bullying, obsession with firearms, isolation," said Sandy Hook Promise Founder Mark Barden, whose son, Daniel, was one of the 20 children killed at Sandy Hook Elementary School in 2012. "You see this whole story unfolding of all these warning signs that are right there, right up in plain view that people may or may not pick up on....It culminates in what is about to be a tragedy and the whole message is that this is preventable. And you have the power to be the change agent to prevent this from happening," Barden added. 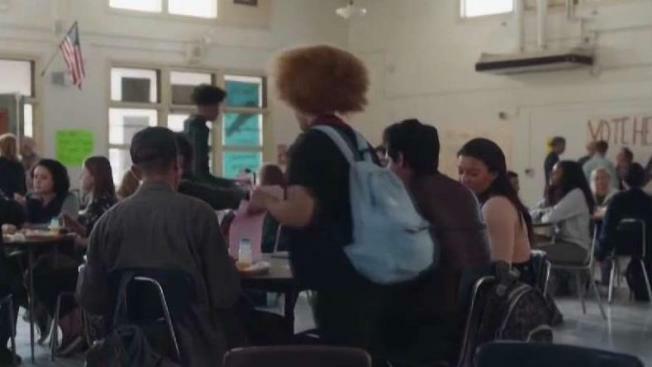 The PSA is part of Sandy Hook Promise's "Know the Signs" campaign, which looks to educate students, teachers and parents about seeing the signs of a potential school shooter and intervening before it's too late. Since 2014, the organization has trained more than 5.5 million people in 50 states with its “Know the Signs” programs. Sandy Hook Promise has also created the "Say Something Anonymous Reporting System," an app that lets students report concerns anonymously in 152 school districts across 25 states. Tips may also be submitted online at saysomething.net or by calling 1-844-5-SAYNOW (1-844-572-9669).